Let’s see if I can come up with a post every day of the rest of the offseason. Today, there are 37 days left until Opening Day on April 6. 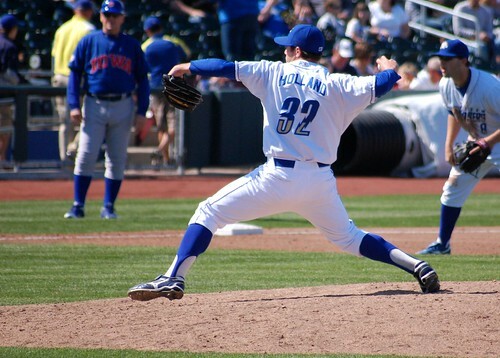 Holland, dominating at AAA before he dominated at MLB. is the number of saves the Royals, as a team, earned in 2011. Most of them were credited to Joakim Soria, despite his down year. Greg Holland picked up four, and the others were spread among a smattering of other relievers. The save, of course, is not an outstanding indicator of a reliever’s talent, nor does the pitcher who gets a save necessarily add the most value, or most increase his teams likelihood to win. You probably know this, but just in case: Let’s go marvel at the incredible season Greg Holland had last year. He was, by far, the best Royals reliever, but does not possess the title of “closer,” so really, the casual fan might not know who he even is.